Ryan's Pharmacy was established in 2012 and is an independently owned Community Pharmacy. Ryan's Pharmacy is jointly owned and jointly managed managed by Brian Cronin MPSI and Gordon Ryan MPSI. Brian and Gordon studied Pharmacy together in Trinity College Dublin and qualified in 2000. Brian and Gordon have many years of experience and are pleased to offer whatever advice and assistance that they can to their patients. 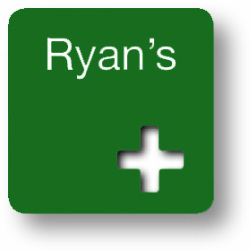 Ryan's Pharmacy is located at Unit 1 Greendale Shopping Centre, Kilbarrack, Dublin 5. The Pharmacy is beside McHugh's Centra in Greendale Shopping Centre. There is free parking available directly in front of the Pharmacy. As an independently owned business we strive to provide excellent care and personal customer service to all our customers. We dispense all prescription types (Medical Card, DPS, Long Term Illness, IVF, etc..) and we stock a large range of OTC medicines, first aid supplies, sports supports and vitamins. We stock a range of perfumes, cosmetics and lots of gifts. We have accounts with all the major wholesalers in Ireland and the United Kingdom and we are happy to try to source any pharmaceutical product for our customers.